Having been crowned London’s best buskers, The Tailormade have gone from strength to strength supporting the likes of Madness, Olly Murs, Tom Jones and Jess Glynne to over 100,000 people. 2018 is already earmarked as their year, with a country wide university tour and the release of brand new music. Welcome to the Calling, lads! 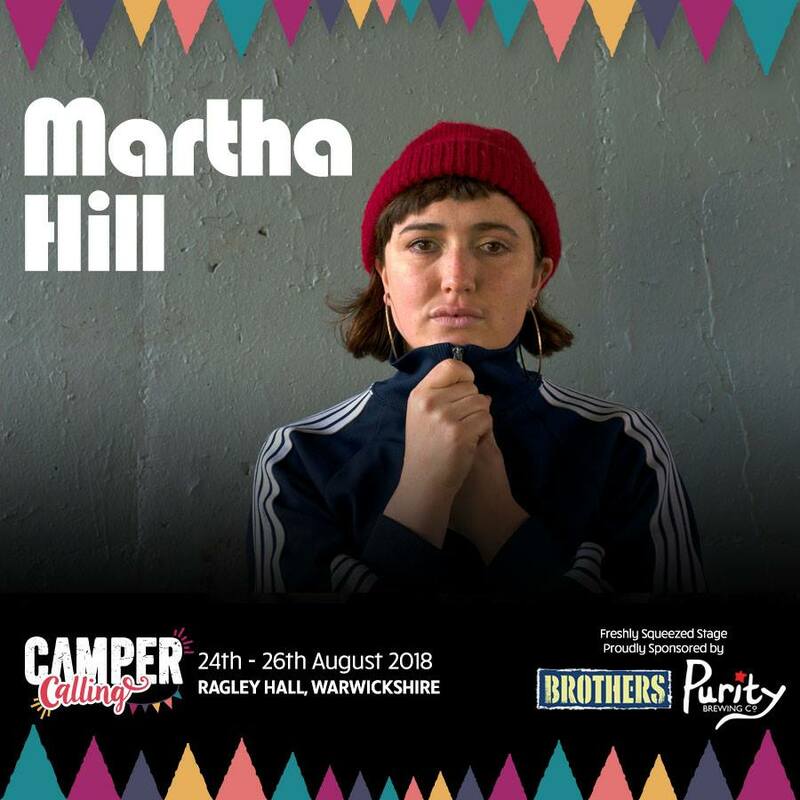 Martha Hill is an alternative pop artist based in Newcastle upon Tyne. After growing up as one of six siblings on a remote Scottish peninsula, she left home at 17 and spent two years touring across Europe as a street musician. Honing her craft and sound, she relocated to north east England and hasn’t stopped touring since! Georgia grew up listening to soul, motown, reggae and jazz, and it’s certainly distinguishable in the band’s style and performance. Having previously supported Squeeze, Georgia and the Vintage Youth have quite the fan base, and have worked alongside Neville Staple, Mo Pleasure of Earth Wind and Fire and more. The perfect blend of big band and theatrical sounds, they are sure to have you dancing in no time! This garage punk trio from Birmingham have been making waves across the UK music scene since 2015 with their energetic performances and punk tunes. Getting plays on BBC Radio 1 as well as BBC 6 Music, these guys have been compared to the likes of The White Stripes as well as The Undertones and Blondie. Here to make some serious noise at Camper Calling, we can’t wait to see what they bring. Opening the Freshly Squeezed Stage on Sunday this year is Paul Smith. A Camper Caller from day one, his relaxed style is the perfect vibe to get you ready for the festival mood! Although a fresh face to the music scene, Betsy’s voice will instantly transport you back in time with her soulful, classic and distinct tone. Already a regular on radio, her songs including Radio 2 Record of the Week Waiting, Wanted More and Lost & Found are nothing short of passionate, catchy and inspiring. From the streets to the stage, these buskers turned bellowing band are hijacking our main stage at Camper Calling. Mixing ghosts of American folk music, swing, jazz, country with modern hip hop, dubstep and house is no easy feat but somehow, CC Smugglers have got the whole sound down, whilst getting you guys up on your feet! You can expect nothing but good old Southern rhythm and blues with The Atlantic Players. Having toured with some some of the greats including Geno Washington, Martha Reeves, Joe 'Pep’' Harris, members of ub40 and more, it’s just one big party when you catch these guys live ! Combining intelligent, provocative lyrics with dangerously catchy hooks and a feel good groove, this is music for the thinking man to shake his a*se to! Having toured with the likes of Mos Def and Bonobo and performed at Glastonbury and Bestival, to name but a few, Lazy habits offer up brass-fueled soulful hip-hop stories. The London seven-piece describe their sound as “beats, rhymes and brass of the highest calibre”, and it’s easy to hear that confidence ooze from the pores of their self-titled debut album. Their onstage energy is contagious and will stay with you long after they’ve left the stage, and it’s this bombastic energy that has seen their music championed by UK tastemakers such as Huw Stephens, Joss Stone, Ghostpoet and a host of BBC Radio DJs. Powerful and melodic, Soley Mourning have that quintessential late-80s/early-90s American alt/grunge vibe, yet hail from the UK’s Black Country! These guys have riffs coming out of their ears, and they pull sounds from the likes of Soundgarden, Rage Against The Machine as well as Led Zeppelin. This is a classic rock five-piece destined for greatness.